Downloaded from the Food and Water Watch website. This was what another cyclist yelled at me as he passed (I’m sporting this sticker on my helmet). It happened earlier today, when I was getting in a last bike ride in Prospect Park before Hurricane Sandy makes its much heralded visit. 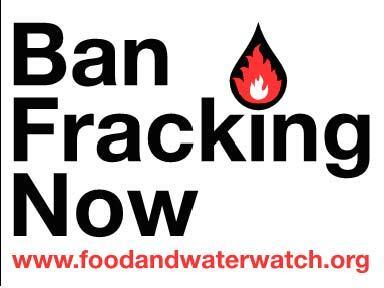 My response was on the lame side (“ban fracking–keep water drinkable”). I’ve written here before about the struggles against the Spectra natural gas pipeline being pushed through that will go under Gansevoort Street in Manhattan. One of the fears (which is looking to be prophecy now) is that having a huge natural gas pipeline in NYC will serve as an impetus to fracking the Marcellus Shale range. Governor Cuomo has been playing two sides of this issue–he’s getting pressured to allow fracking in NY upstate, where the economy has been in horrible shape for years and pro-fracking sentiment is running high. And this isn’t just in New York State–lots of people in rust belt states like Ohio are hoping for a natural gas bonanza. And who can blame them, when even our President is talking about 100 years of natural gas supply? The ‘100 years of Natural gas’ canard was promoted several years ago in a widely-circulated press release by the Potential Gas Committee, a pro-extraction lobbying group. This (along with the ‘clean coal’ oxymoron, a greenwash campaign that has received tens of millions of dollars from mining companies) has been part of the Obama White House mantra for much of the election campaign. And of course, such sentiments have been part of Romney’s campaign from the get-go. But the 100-year supply argument is blown apart pretty effectively here. Even if all of the ‘potential’ gas comes online and even if the environmental damage is minimal, the 95 years of supply are based on an annual usage of some 24 TCF(trillion cubic feet) in the United States. How is demand going to stay flat? The US more than doubled its daily use of oil between 1971 and 2005, even after two disastrous oil price shocks and a current per-barrel cost that is more than triple what it was during the Clinton Administration. And the 100 year supply meme assumes there aren’t new demands being placed on supply. We already know that the Germans are going to phase out of nuclear power by 2022–they’ll probably replace some of that with natural gas-powered plants. The Japanese government is getting huge pressure from citizens to phase out nuclear power as soon as possible, even as business leaders argue for continuing with nukes. The go-to fuel is natural gas. So the chances are very good that fracked gas won’t even stay here. And once demand grows, prices will go up as well. And here’s a piece from The Oil Drum about shale natural gas. It points to a problem that has been the dirty secret of the whole shale ‘bonanza’. Basically, shale extraction is much more expensive than conventional extraction, and ARC Financial Research has been reporting that shale extraction projects are running big deficits and require much more in the way of investments to keep active. Couple that with whatever costs are required to clean up after fracking, and it’s not at all clear that we’ll be able to afford to get all of that shale oil (and the natural gas) extracted. The reality is that fossil-fuel based energy is going to be increasingly expensive. Couple that with the problems caused by Global Climate Change, and it’s clear that we should’ve gotten the message back in the 1970’s. Our national response to the Arab Oil Embargo was to ramp up the military and base much of our military strategy around securing oil supplies by any means necessary. Other countries took different lessons away from the oil shocks of the 70’s and 80’s. In the Netherlands, the 1973 oil shock moved the Dutch Prime Minister to frame this as a life-changing event that should motivate citizens to find ways to live a less-energy-intensive way of life. It’s how The Netherlands got its excellent network of bike lanes and energy-smart policies. What’s making America poor is not our refusal to embrace fracking, or mountaintop removal or deep water drilling for oil. What’s making America poor is our unwillingness to make a plan b for oil and natural gas no longer being plentiful and cheap. That day is here and both parties are silent.